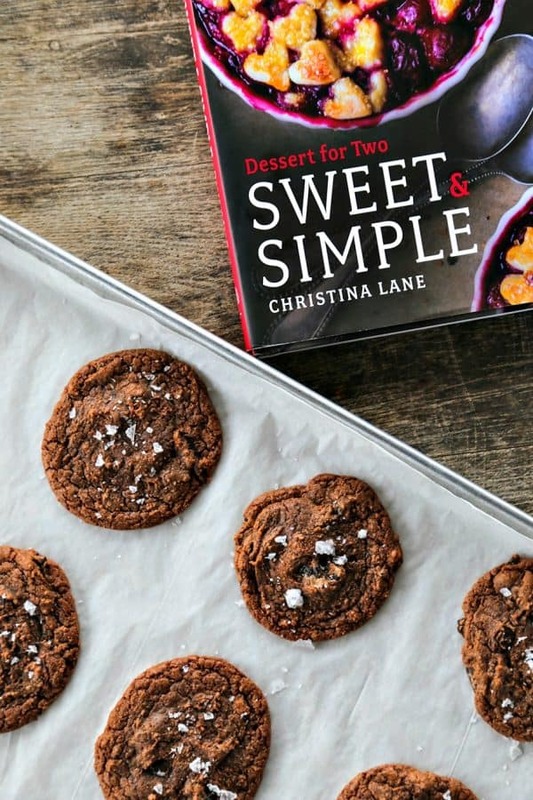 Today I’m sharing a recipe for rich, deep, dark, and amazing Easy Double Chocolate Nutella Cookies from one of my new favourite cookbooks –Sweet & Simple– by Christina Lane. 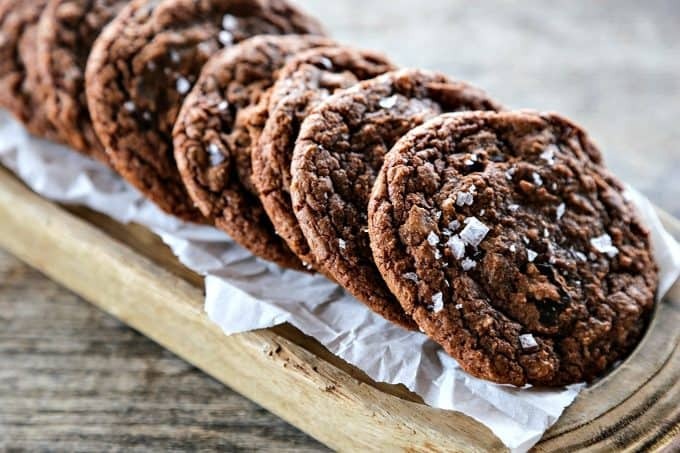 These Nutella cookies studded with melted dark chocolate chunks and a dusting of sea salt are perfect for dunking in milk, tea, coffee, or stashing in apron pockets for a sweet treat. I have what you might call a Nutella fixation. At any given moment you can find several little jars or one food service sized bucket of Nutella in my kitchen in various stages of being emptied. If there is a Nutella based snack at the store, there’s a good chance I’ll impulse buy it at least once. If a recipe has Nutella in it? I’m quite likely to give it a try. That being said, I’m also tremendously picky about my repeat Nutella snacks. Because it’s so good, I’m not going to waste it on making something more than once that wasn’t sublime. 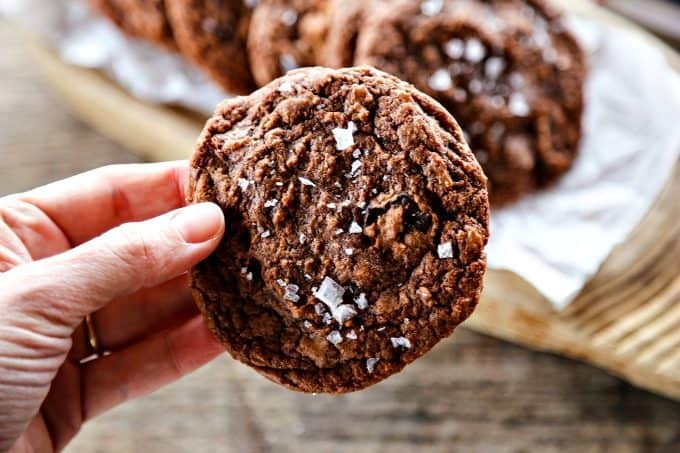 When I saw Christina’s recipe for Easy Double Chocolate Nutella Cookies (referred to in the cookbook as Easy Chocolate Hazelnut Cookies) it drew my eye. When I realized that there were only 6 ingredients and that the main ingredient was straight-up Nutella, I knew I had to give it a try. I made the batch. I ate the batch by myself. I made a second batch and a third batch and shared them. Don’t even look at me like that. Sweet & Simple is based on small batch cooking. So when I inhaled the entire batch of Easy Double Chocolate Nutella cookies, I was -in fact- only eating 6 cookies. One for each ingredient in the cookies. In case you didn’t make the connection there because the time change was this week and your brain hasn’t caught up yet, I’ll spell it out for you. I liked this enough to use my Nutella on it more than once. In fact, not only did I make THREE batches the first night I made them, but I made a quadruple batch the second night I made them which just so happened to be the night after the first night I made them. Hang on now. I had a very good reason. In addition to what I mentioned before about the recipe making only 6 cookies, there are 7 people in my family, and I wanted to have 3 cookies to pack to take with me on a business trip the next day, so mathematically I was required to make a quadruple batch of Easy Double Chocolate Nutella Cookies. Before anyone gives me the “oh, you were REQUIRED to take cookies on an airplane” side-eye, let me justify myself; I wanted to see how well these cookies held up to both travel and sitting around for a couple of days. If you’ve ever had teenagers in the house -of which I currently have 4- and if you’ve read about my whole doughnut bread pudding debacle, you’ll realize that keeping two temping, deep, dark Easy Double Chocolate Nutella Cookies just lying around is next to impossible. I had to remove myself from the home to make that happen. I’m happy to report that they held up beautifully to travel after having cooled overnight and that eating my last cookie three days after it was made was almost as good as eating an entire batch straight from the oven. Almost. Guys. There’s not much to this. Just mix all the ingredients together in one bowl and scoop onto a parchment or silpat lined sheet pan or cookie sheet. As for how far out to space them, I’d say giving 2-inches between your piles of cookie dough should be sufficient. I like to use a large cookie scoop for these gorgeous cookies. Christina specified using chocolate chips, but I swapped in dark chocolate chunks, because that’s just how I operate. Chocolate chips or chocolate chunks; use whatever makes your heart happiest here. 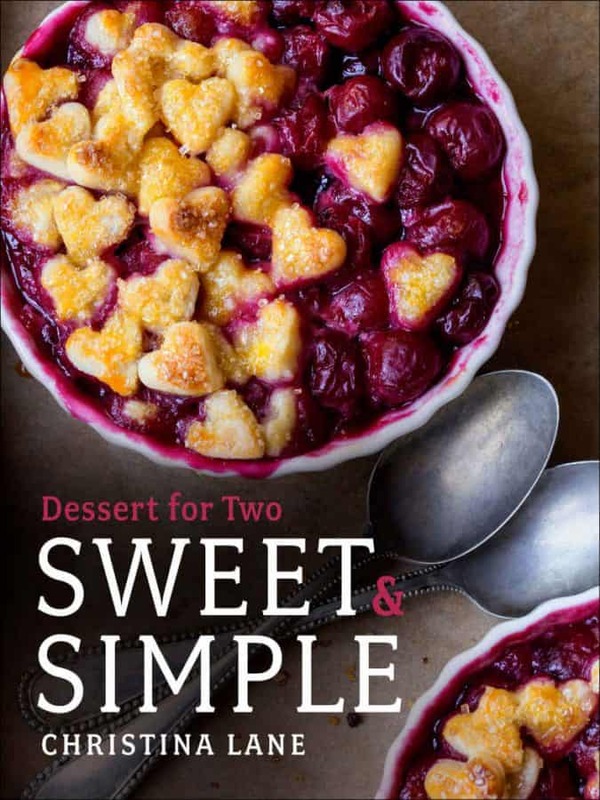 I was really excited to receive a copy of the Sweet & Simple cookbook for review because I habitually cook in enormous quantities to feed our army sized family. The truth is that sometimes, I just want a little treat for my husband and me, or sometimes I don’t want to be tied to the kitchen for two hours just to make enough brownies for everyone to have a couple of bites of sweetness. Number of Photos: Every recipe has a corresponding photo so you can see what the end product will look like. Difficulty level: Easy-beginner to Intermediate. These cookies are as easy as it gets and there are quite a few other recipes just this easy. There are a few that require you to have some basic kitchen skills such as swirling together two different batters or baking something in a water bath. Christina makes it easy, though, by explaining the processes clearly. Ingredients: I didn’t see one single ingredient that was difficult to find in Sweet & Simple. The only thing I could think of that might be somewhat unfamiliar to some folks is Chambord: a raspberry liqueur called for in one recipe, but it is easily found at most moderately stocked liquor stores. 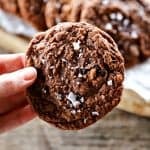 Recipes I Tested: Easy Chocolate Hazelnut Cookies, Coconut Sugar Cookies, and Peppermint Brownie Bites. They were all sublime. 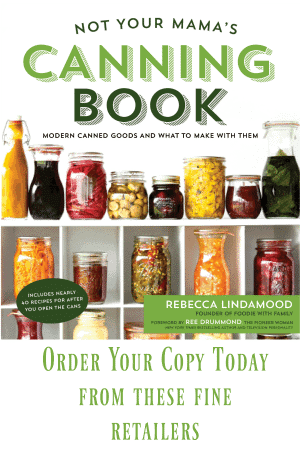 Recipes I Want to Try Soon: I honestly want to try everything in the book, but the short list for trying soon is Earl Grey Creme Brulee, Easy Baked Alaska, Camille’s Cupcakes, Chai Poached Pears and Cream, and Small Carrot Cake. Do I Recommend This Book: Yes. Without reservation. I recommend it for singletons and couples, small families, and large families. I can speak from experience to say that the ones I have tried work on the original, small-batch level, but they also scale up easily to feed larger numbers of people. Buy Sweet & Simple Here. 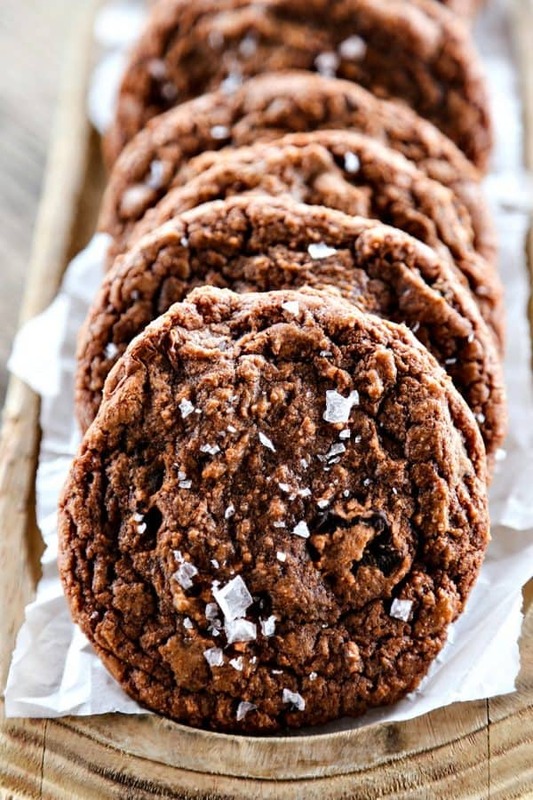 These Easy Double Chocolate Nutella Cookies with a dusting of sea salt are ideal for dunking in milk, tea, coffee, or stashing in apron pockets for a treat.Recipe used from Dessert for Two: Sweet & Simple Cookbook courtesy of Christina Lane, just barely adapted by Rebecca Lindamood. Preheat oven to 350°F. Line a sheet pan with parchment paper and set aside. In a mixing bowl, use a sturdy spatula or wooden spoon to stir together the Nutella, granulated sugar, and egg until it is evenly mixed. Add the flour and chocolate chunks and mix until the flour and chocolate are evenly distributed. The cookie dough will be glossy. Use a large cookie scoop to divide the cookie dough onto the lined sheet pan. If you do not have a cookie scoop, divide the dough into six even portions and roll into a ball with your hands. Place the cookies 2 to 3 inches apart on the cookie sheet. Bake for 10 to 11 minutes, or until the outer edges of the cookies are firm and the inside is set when you touch gently with the tip of your finger. Remove the pan from the oven and immediately sprinkle sea salt flakes over the tops. Let cool for 2 minutes on the pan before transferring to a wire rack to finish cooling. Let the cookies cool completely to room temperature before transferring to an airtight container to store. It’s mutual, girl. I’m so honoured you let me review your book. Can hardly wait to try these cookies. I can be found walking around my house with a jar of Nutella and a SPOON! Nobody is to touch my Nutella. However, I might be able to share a cookie or two! Hmmmm. I am not seeing the ‘four’ typo at all. I CTRL-F searched it and everything! 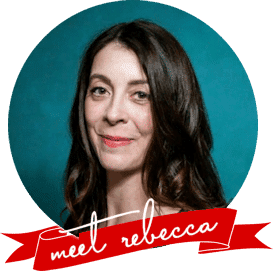 Rebecca, thanks for responding so quickly to my question. I see you fixed “four” to flour in the ingredients, but you forgot to add “cup” to make it state: 1/2 half cup of flour. It’s the word “cup” that is missing from the ingredient list for flour. I made these cookies last night, with a broken-up, double dark chocolate bar, a sprinkling of regular sea salt, since I don’t have flakes. They came out delicious. I am going to try these great recipe right now and let you know, baby. I will try these when I’m off thanks.